Tooth enamel: the hardest substance in the human body. 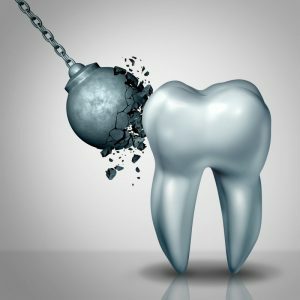 While tooth enamel does amazing things to protect our pulp, dentin, and other inner parts, it is not indestructible. Acids produced by bacteria can still wear it down and using our tooth on inedible objects will increases our chances of having a dental emergency. With that being said, enamel is quite resistant to the regular wear and tear we subject it to on a daily basis. Furthermore, your dentist in Waco says tooth enamel consists of many proteins to do its job as well. After reading this, you’ll be happy to make it last for as long as possible. Thanks to research coming out of the University of Southern California School of Dentistry, researchers were able to learn more about the genes that affect the formation of tooth enamel. After analyzing the gene most critical for teeth formation, they found that the gene expresses production of a protein (dentin sialophosphoprotein) that splits into two proteins. These proteins are dentin sialoprotein (DSP) and dentin phosphoprotein (DPP) and have opposite functions of each other. These proteins are key in the formation of enamel and dentin, two substances that cover teeth. However, what researchers found out after overexpressing them in the lab, might surprise you. After isolating the DSP and DPP proteins, researchers found that DSP overexpression increased the hardness and rate of formation in tooth enamel of animal subjects. Over expression of DPP however, caused enamel to become more pitted and prone to fracture and wear. Dr. Michael Paine, a researcher at the USC dental school, believes that DSP could have the potential to act as a protective agent in dental care. Even though DSP is only expressed in dentin and a very thin layer of enamel that meets the dentin, it also appeared to be considerably harder than most enamel covering teeth. If DSP could be incorporated into the entire layer of enamel, it would have similar properties to how fluoride acts in water, according to Dr. Paine. This would make teeth harder and therefore more resistant to decay in patients. While overexpressing DPP causes weaker teeth, it is still critical to proper teeth formation and the early stages of mineralization. This only proves how precise scientists need to be use the DSP protein to their advantage. According to your dentist in Waco, protecting your teeth is as easy as brushing twice a day with a fluoridated toothpaste, flossing daily, visiting your dentist every six months, and managing your diet. Avoid eating sugary or starchy foods throughout the day as decay-causing bacteria enjoy eating these foods the most. Want to learn more about the science behind tooth enamel? Visit your family dentist in Waco and ask a question during your regular appointment! Dr. Rick Cofer knows all too well about the damage that poor oral care can cause. During your appointment, you can expect a very high level of care that’s catered to your needs, whether it’s performing a cleaning, an examination, periodontal care, or children’s dentistry. To learn more about his preventive treatments or about his practice, contact him at (254) 732-0309 or visit his website. by: Dr. Rick Cofer at April 2, 2018 .